When robots are not trying to take over the world, they can also try to make you drunk! Drinkbots combine the efficiency of technology with the whimsicality of art. They are not vending machines, they are one of a kind interactive contraptions designed to please humans at parties. These contraptions are available to rent for parties and special events. Please contact Obtainium Works for rates and guidelines (neverwashaul@gmail.com). It’s one thing to order a cocktail drink at a bar, but when the bartender is a robot, you have another level of experience! TikiTron is a drinkbot, a type of robot designed to take over the human race by getting them very drunk! 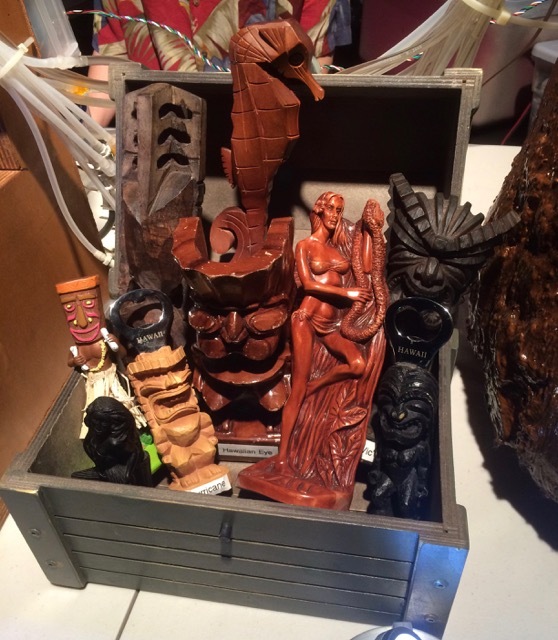 TikiTron’s speciality is embedded in the name: Tiki Cocktails! These Rum-based drinks are complicated to make and easy to screw up. A little too much simple syrup and it’s too sweet; add too much lime juice and it’s too tart. What if you could build a robot that makes the perfect Mai Tai, a deadly Scorpion, or a wild Hurricane, every time? That is power (and the danger) of TikiTron! Throw in a bamboo hut, sacrificial idols, and an angry volcano god, and you have a tropical adventure that you’ll never forget! On The New Screen Savers, Leo Laporte and Jason Howell meet the TikiTron creators, Dr. Bombay (Samuel Coniglio), Kiki Jewell, and Katherine Becvar. Their drinkbot uses a Raspberry Pi 3 Model B, 12 peristaltic pumps, Adafruit DC and Stepper Motor HATs, and requires a sacrifice with an RFID tag - plus some dancing! A live demo of the TikiTron Drinkbot at the Second Annual Cocktail Robotics Grand Challenge, at the DNA Lounge in San Francisco, July 10, 2016! Bringing civility and art into a world full of cold robots is a noble gesture. Unlike most drinkbots which look ugly while serving cocktails, The Tea Engine hearkens back to a more elegant era, where handcrafted machines were both beautiful and functional. The Tea Engine is a robotically controlled tea service made from an antique coffee percolator from the mid-1920s. Those wishing tea simply need dial the number on the rotary dial that corresponds to how they take their tea. A microcontroller reads the number of pulses from the dial and dispenses tea to suit one’s preference. 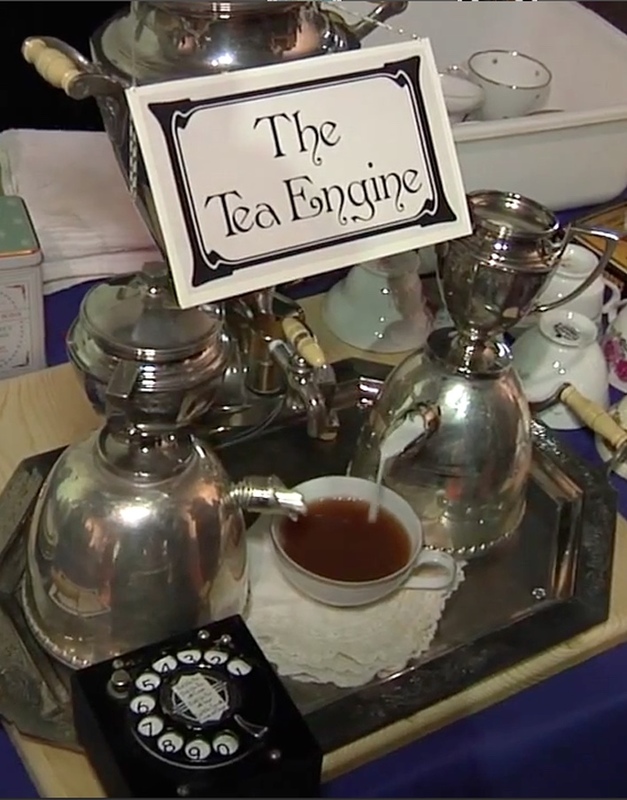 The Tea Engine can be programmed to embellish tea with either milk and sugar, or peach and ginger liqueur depending on the nature of the event and the audience that we are serving. In keeping with the general theme of fanciness, one's tea is served in a fine china cup. 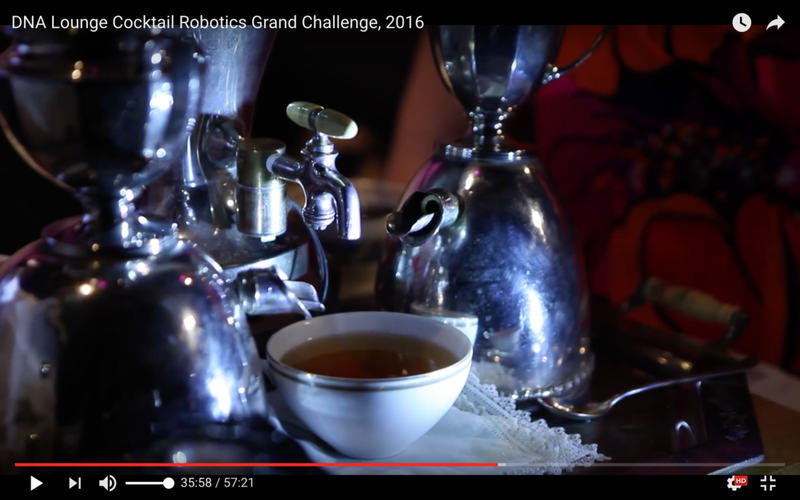 The Tea Engine demo at the Second Annual Cocktail Robotics Grand Challenge, at the DNA Lounge in San Francisco on July 10, 2016!